"Leading through Faith and Advocacy"
How does faith inspire social justice work? How does advocacy inform faith? 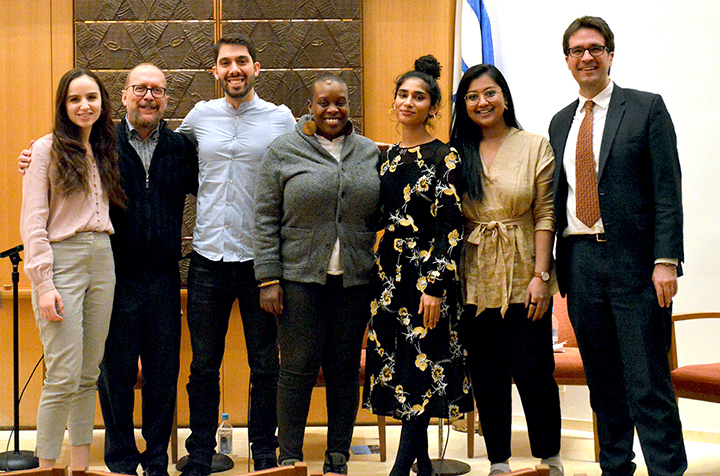 When the Interfaith Center of New York (ICNY) launched a campaign called #FaithJusticeHero, we invited New Yorkers to celebrate leaders from diverse faith communities who are doing inspiring social justice work. Four of these impressive young #FaithJusticeHero’s join host Hannah Meholick on this episode of ICNY’s “Interfaith Matters” podcast, to discuss faith and advocacy. These leaders share their stories. Have a question for our guests, or a comment on our podcast series? Please feel free to leave comments on your podcast player, or send us an email at podcast@interfaithcenter.org. And please be sure to rate us! "Interfaith Matters" is co-produced by host Hannah Meholick and engineer and editor Jeff Berman, and executive produced by Kevin Childress. Learn more about the podcast team on our website. Intro and outro music for this episode are excerpts from “Maximum Relax” by Lee Rosevere, used under CC BY 4.0 / Edited from original. In this episode of Interfaith Matters, two New York City leaders – one Jewish and one Muslim – discuss the importance of food in bringing people together across lines of cultural and religious difference. Rabbi Joseph Potasnik, executive vice president of the New York Board of Rabbis and co-host of “The Rev and The Rabbi” program on 77 WABC Radio, is a leading advocate for offering kosher and halal meals in New York City’s public schools, an initiative which received funding last year to launch a pilot program. Mohammad Modarres, a Ted Talk resident and keynote speaker, is the founder of Abe’s Meats, a business that produces meats which are both Zabihah Halal and Glatt Kosher. Proceeds from Abe’s Meats are used to fund Interfaith Ventures, a nonprofit that Mohammad co-founded to promote interfaith dialogue and unity. 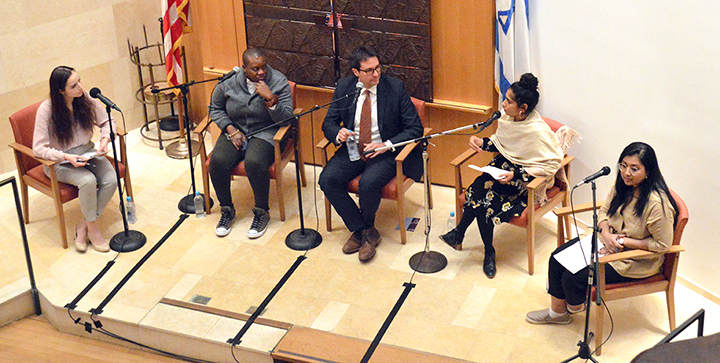 Rabbi Potasnik and Mohammad Modarres met up recently for this conversation on food and faith in the Library of the East End Temple, with a few friends in the audience. “Interfaith Matters” is hosted by Hannah Meholick, and engineered and edited by Jeff Berman. Learn more about the podcast team on our website. Intro and outro music for this episode are edited excerpts of “Maximum Relax” by Lee Rosevere, used under CC BY 4.0 / Edited from original. In the last episode, we looked at how Orthodox Christianity made its way to the United States and established communities here in New York City. In this episode, we experience exquisite expressions of Orthodox faith in architecture, paintings and music, while examining how different groups of Orthodox Christians are connecting across lines of faith. Why do Orthodox Christians venerate icons? How does the architecture of an Orthodox church evoke the embrace of God? How does music uniquely articulate Orthodox faith? And how do Orthodox Christians in New York City share their traditions and practices with non Orthodox Christians? Listen in, and experience the faith of our 200,000 NYC neighbors. “Interfaith Matters” is hosted by Hannah Meholick, and engineered and edited by Jeff Berman. Learn more the podcast crew here. Don't forget to wish "Happy Christmas" to Christians today - that is, to the hundreds of millions of Orthodox Christians in the world who celebrate Christmas on January 7 (or in some cases, January 6). Orthodox Christianity is ancient - with some churches connecting their lineages back 2,000 years to particular disciples of Christ - and while various forms of Orthodox Christianity are prominent in Russia, Greece, Egypt, Syria and many other countries, there over a million followers in the United States, and around 200,000 here in New York City. It is our NYC Orthodox Christian neighbors who are the focus of today's podcast episode, an interview with four leaders of communities in Manhattan and Brooklyn. We learn from them how each community made its way into the United States, and settled in New York City, sometimes initially facing severe discrimination. We also examine the challenges the Orthodox Christian Churches face in New York when representing the history, tradition and values of an ancient faith, while ministering to people living in this modern, diverse city, and also welcoming new immigrants (and sometimes refugees) arriving with no familiarity with English language or American customs. This discussion is a rich and rewarding foray into Orthodox Christian life in New York City - so much so that we decided to present it in two parts. Subscribe and watch your favorite podcatcher for the second episode to drop in a week or so, which will focus on the "sights and sounds" of Orthodox Christianity such as liturgical music, art and architecture - what you see & hear might be surprising! Our guest is Rabbi David Rosenn, executive director of the Hebrew Free Loan Society, which since 1892 has offered interest-free loans to New Yorkers needing immediate financial help or wanting to invest in their futures, but who can't afford or do not qualify for commercial credit. We talk with Rabbi Rosenn about the moral motivation of faith in coming to the financial aid of our neighbors in need. What is "Economic Justice"? : "I think Economic Justice is a set of social arrangements where everyone has the opportunity to acquire what they need to live a decent and dignified life." How do religious traditions speak to issues of poverty and economic inequality? "Poverty is disastrous from a religious point of view because it tends to obscure the image of God in people who are poor ... and even more tragically, prevents people who are poor from seeing themselves in the image of God...Working to end poverty is working to restore the image of God." What is "Moral Imagination"? "Picturing the way that the world might be, and considering our responsibility to help get it there, and how we partner with God in that ongoing act of creating the world." Have a question for our guests, or a comment on our podcast series? Please feel free to leave comments on your podcast player, or send us an email at socialmedia@interfaithcenter.org. And please be sure to rate us! "Interfaith Matters" is hosted by Hannah Meholick, and engineered and edited by Jeff Berman. Learn more about Hannah and Jeff on our website. Intro and outro music for this episode are edited excerpts of "Maximum Relax" by Lee Rosevere, used under CC BY 4.0 / Edited from original. Our guest this time is community activist and teacher Dr. Debbie Almontaser, board president of Muslim Community Network, and founder of Bridging Cultures Group, Inc. Hannah and Debbie discuss faith and feminism. On Feminism in Islam: "There is so much misunderstanding about the role of women in Islam. I feel that feminism has been within the Islamic tradition for the last 1,400 years ... the list of 'sheroes' in the Islamic tradition is really vast." On Modesty: "How much modesty a woman should observe (or not) and who gets to judge whether she is or not, is very troubling, something we as women and our male allies need to challenge. It's a woman's choice... I choose to wear the hijab as a form of worship... as a connection between me and God ... and I do it with pride, and dignity, and celebration." On Objectification of Women: "I am deeply alarmed when I look at ads to sell cars and alcohol, that they all have women in them. Women should not be the "icing on the cake' to sell something." We'd like to offer props to our underwriter, One Spirit Learning Alliance! In this episode, Hannah Meholick talks with Frank Fredericks, founder of World Faith, an international nonprofit based here in New York City that mobilizes religiously diverse young people to address religious violence. Frank is also an interfaith chaplain at New York University. Today we talk with Frank about how religious, economic, political, psychological – and even biological – factors contribute to a person’s propensity for violence. We’d like to offer props to our underwriter, One Spirit Learning Alliance! “Interfaith Matters” is hosted by Hannah Meholick, and engineered and edited by Jeff Berman. Learn more about Hannah and Jeff on our website. "We Come Together to Go Further"
In this episode, Hannah Meholick talks with Amina J. Mohammed, Deputy Secretary-General of the United Nations and former Minister of Environment of the Federal Republic of Nigeria. Ms. Mohammed was instrumental in bringing about the United Nations' unprecedented 2030 Agenda for Sustainable Development including the Sustainable Development Goals (also known as "SDG's"). For her contributions to worldwide sustainable development, The Interfaith Center of New York will be honoring the Deputy Secretary-General with the James Parks Morton Interfaith Award at its 21st annual gala celebration on June 11. Please click here if you are interested in attending the event. On the benefits of diversity within her own family: "I grew up as a Muslim, but we have such a multi-religious family because my mother's father was a Presbyterian minister. My father was a Nigerian veterinary doctor, and my mother, a Welsh nurse, so I come from two sides, which is great, because I see through two lenses all the time, it's never one way." On the partnerships required to make sustainable development possible: "When you think about religions, at the core of them, is about understanding and mutual respect. And for partnerships, it's the same thing. So it's another dimension of how we come together to go further. On working with faith leaders toward sustainability goals: "Meeting with religious leaders was, for me, a way to get across to a number of messengers my message, and also to hear back from them, what it was perhaps we were not messaging right." On the value of interfaith dialogue: "There are some challenges that cross faiths - female genital mutiliation goes across faiths - that's culture. And when you address that, it's interesting to get faiths together, to tell the culture that it's not right. Many times, in the conflicts that we have, it's the interfaith dialogue that helps us get through it." We launch Season Three of Interfaith Matters with guest Sunita Viswanath, executive director of Sadhana: Coalition of Progressive Hindus and co-founder of Women for Afghan Women. Sunita, a Brooklyn resident, has worked for over two decades in women's rights and human rights organizations, and co-founded Sadhana in order to bring together her activism for human rights and her identity as a Hindu. Sunita, on her early motivations to engage in social justice work: "When I see faith-based justice work, I hunger for Hinduism to be a part of it. And I waited for that to exist in my world, and because I couldn’t find it, I guess I – along with friends – am making it." On the Hindu caste system: "In Hinduism, one of our deep, shameful, painful, horrible blemishes is the reality of the caste system. And so, for generations upon generations, people within our own human family have been dehumanized in the most unspeakable ways. What is the meaning of Hindu expressions of Oneness if we’re creating these divisions which are responsible for perpetrating the most extreme violence?" On the meaning of "Sadhana": "'Sadhana' means 'the doing of Hinduism.' [It's] a verb, it’s an action word, and those of us that started Sadhana didn’t want to talk about the justice we wanted to see in the world, we wanted to be it, we wanted to do it, and so our name reminds us – every day – that whatever we are talking about, we want to be creating it, manifesting it, building it in the world." We're so pleased to welcome back One Spirit Learning Alliance as an underwriter of Interfaith Matters! Have a question for our guests, or a comment on our podcast series? Please feel free to leave comments on your podcast player, or send us an email atsocialmedia@interfaithcenter.org. And please be sure to rate us! This time on “Interfaith Matters,” host Maggi Van Dorn is our guest! ICNY’s Director of Programs, Dr. Henry Goldschmidt, talks with Maggi about her Catholic faith background, as they reflect on two seasons of podcasting, highlighting some memorable interviews with New York City faith leaders, and discussing how podcasts are such a valuable forum for interfaith conversation. As Maggi departs our podcast after two wonderful seasons, we wish her tremendous continued success as the Religion and Spirituality producer at Spoke (a new podcasting app from SiriusXM) and as associate producer for The Adventures of Memento Mori podcast, which was just named one of The Atlantic’s 50 Best Podcasts of 2017.